Amplification of DNA strands (G-block) using polymerase chain reaction (PCR) to create enough DNA template for production of RNA by in vitro transcription. The amplified DNA templates were tested by 1% agarose gel electrophoresis and the desired DNA products were purified using GFX DNA Purification Kit prior to further use. To construct RNA origami, the amplified DNA was used as a template. We produced RNA origami with in vitro transcription. The RNA origami structures were characterized using 6% acrylamide gel electrophoresis. Prior to using RNA origami as an anticoagulant, the RNA from in vitro production was purified using an RNA Clean-Up Kit. Finally, the RNA products were heat-annealed to form the desired structures. To produce RNA origami structures which strongly and selectively bind thrombin. In cells, transcription of DNA to RNA constantly occurs in order to produce signals and subsequently to translate messenger RNA to structural and functional proteins which allow the cell to function. The natural transcription process can be mimicked in vitro by using the correct temperature and materials found naturally in cells such as DNA, RNA polymerase, nucleic acid building blocks called NTPs, and other components. Transcription in vitro can be used to mass produce RNA, and the sequence of this RNA can be controlled by using a specific DNA template (Figure 1). In recent decades, chemists and molecular biologists have developed chemically modified oligonucleotides that can be incorporated into RNA using in vitro production. Beyond the natural production of native RNA by living cells, in vitro production can also produce modified RNA using modified NTPs (Figure 2) and mutant polymerase (1-6). This modified RNA has certain characteristics which normal RNA does not have, such as high stability in plasma, thermal stability, and nuclease resistance (4-6). Figure 1 Transcription of DNA template to RNA origami structure. In our project, we aimed to produce both modified and non-modified RNA origami structures which have novel anticoagulant functionality. The RNA origami comprised of two main parts: (i) core structure, 2-helix RNA origami, and (ii) functional moieties, thrombin-binding aptamers. To maximize the anticoagulation activity, we designed and produced multiple origami structures with various aptamer placements. The four designs of RNA origami with aptamer placement can be found in RNA origami design page. Four different DNA sequences were amplified and used for transcription. Each sequence was a double stranded DNA, and each had differing aptamer placements. Three of the sequences had two aptamers and one of the sequences had none, which provided a negative control. First, we amplified DNA template from G-block by PCR in order to get enough material for in vitro transcription. Details of the PCR setup, reaction mixtures, and DNA primers can be found in the materials and methods section. Our group was able to successfully amplify all DNA sequences with sufficient yield for transcription. 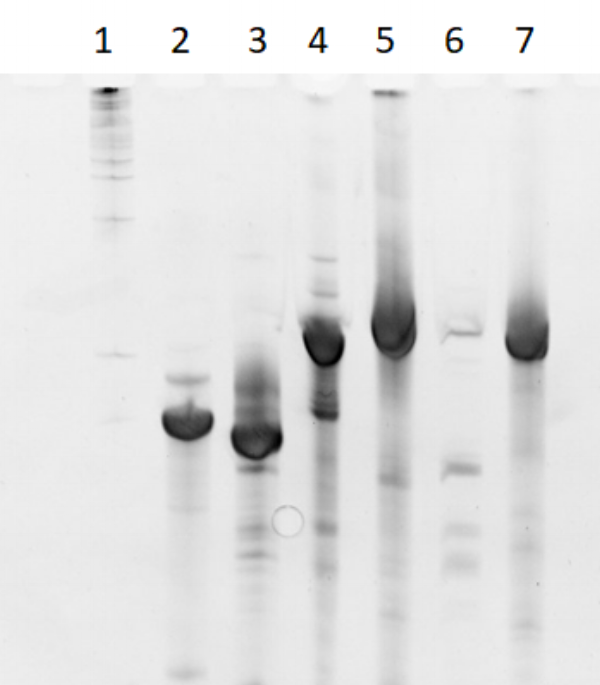 Figure 3 shows two 1% agarose gels with clear bands of the correct size for all four amplified DNA sequences. 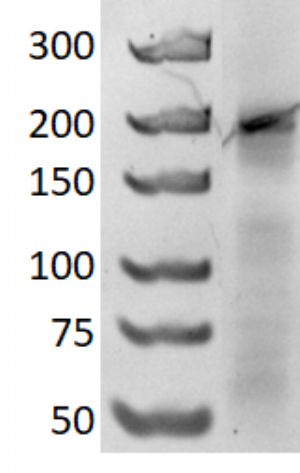 As expected, the sequence with no aptamers appears lower in the gel due to its short length. Its length was expected to be 210 base pairs (bp) while the other three sequences were expected to be 279 and 285 bp. Figure 3a shows faint bands which were longer than the expected strands. These faint bands are suspected to be due to dimerization of the amplified DNA. Each amplification typically produced around 1.58 µg after purification was performed. The RNA origami was then produced by transcription. We produced 2 types of RNA origamis: (i) non-modified RNA origami and (ii) modified RNA origami. To produce modified RNA origami, 2’-fluoro-dCTP and -dUTP were substituted for regular CTP and UTP and mutant T7 RNA polymerase (Y639F) was used instead of wild-type T7 polymerase (4). The mutant T7 RNA polymerase was supplied by our kind collaborator, Prof. J. Kjems at Aarhus University, Denmark. Initially, we had problems producing RNA, this issue was solved by using freshly prepared DTT. The differences in RNA transcribed with and without fresh DTT can be seen in Figure 4. After it was discovered DTT was necessary for transcription, it was added to each reaction thereafter. Figure 4 Differences between transcription with and without fresh DTT. The wild-type T7 RNA polymerase from New England Biolab was used for transcription of non-modified RNA. Non-modified RNA and modified RNA were produced. All DNA sequences were transcribed into modified and non-modified RNA with the exception of 2H-12NN. This sequence was only transcribed into modified RNA due to the timing of when the sequence was designed and ordered. The RNA was labeled “2HO-RNA-XXXX” for the non-modified two helix RNA with various aptamer placements and “2HF-RNA-XXXX” for the two helix modified RNA with various aptamer placements. RNA aptamers which bind to exosite 1 and 2 are labeled as “1” and “2”, respectively. Figure 5 shows the modified and non-modified RNA bands for NNNN, 2NN1, and 1N2N sequences after running through a 6% denaturing polyacrylamide gel at 20W for 1 hour. Figure 6 shows non-modified transcription for NNNN and 1N2N and modified transcription for all four sequences. A smaller amount of RNA was added into the gel for Figure 6 compared to Figure 5 in order to achieve sharper, single bands. Figure 5 6% denaturing polyacrylamide gel run at 20W for 1 hour. 1 kb ladder (lane 1), 2HO-RNA-NNNN (lane 2), 2HF-RNA-NNNN (lane 3), 2HO-RNA-2NN1 (lane 4), 2HF-RNA-2NN1 (lane 5), 2HO-RNA-1N2N (lane 6),and 2HF-RNA-1N2N (lane 7). Figure 6 6% denaturing polyacrylamide gel run at 20W for 1 hour. 1 kb ladder (lane 1), 2HO-RNA-1N2N, 279 nt (lane 2), 2HO-RNA-NNNN, 210 nt (lane 3), 1 kb ladder (lane 4), 2HF-RNA-2NN1, 285 nt (lane 5), 2HF-RNA-1N2N, 279 nt (lane 6), 2HF-RNA-12NN,279 nt (lane 7), and 2HF-RNA-NNNN, 210 nt (lane 8). Following heat anneal, a native (non-denaturing) gel was run to characterize the folded structures. Figure 7 shows an example of a 6% native polyacrylamide gel run at 150V for 3 hours with a 2HO-RNA-2NN1 heat annealed sample and a 1 kb DNA ladder. Figure 7 6% native polyacrylamide gel run at 150V for 3 hours. DNA marker, GeneRuler Ultra Low Range DNA Ladder (left lane) and 2HO-RNA-2NN1 (right lane). In this project, we aimed to produce both modified and non-modified RNA origami structures which would bind with exosite 1 and 2 of thrombin. This was done through the amplification of a DNA template followed by transcription and heat annealing to produce the RNA origami structure. We produced four types of origami structures, three with aptamers and one with no aptamers, and characterize each through gel electrophoresis. We used 2’-fluoro-modified NTPs and mutant T7 polymerase to create chemically modified RNA which was stable in blood plasma. In vitro production allows us to mass produce our structures, creating enough to inhibit coagulation in blood plasma. First, amplification of Phusion G-Block sequence was performed. Reaction buffer, forward and reverse primers, dNTP, DNA polymerase and nuclease-free water was added to a PCR tube in the concentrations shown in Table 1. DNA Polymerase was added last and the sample was pipetted to mix. Table 1 G-block PCR concentrations and volumes. Following PCR, a small volume of the amplified DNA sample (~2-5 µl) was used for testing in a 1% agarose gel. The DNA was run beside a 1 kb ladder (Promega) at 150V for 30 minutes. The gel was then viewed under UV light (ProteinSimple instrument). If the proper band size was observed, the remaining DNA sample was then used for in-solution purification using the GFX DNA Purification Kit (GE Healthcare). 1 µl of the purified solution was used for analysis using the Nanodrop 3000c spectrophotometer (ThermoFisher Scientific). The concentration was recorded for further use and the DNA was kept and labeled (2H-xxxx) for later transcription. Next, non-modified transcription was performed. All contents found in Table 2 below, excluding the RNA T7 polymerase, were mixed in a PCR tube. It should be noted that the DTT used was mixed in-lab to ensure freshness. Lastly, the RNA T7 polymerase was added and the sample was pipetted to mix. The sample was synthesized on ice to try and slow down enzymes, such as RNase, which have a negative impact on the production of RNA. Once all components were added and mixed, the sample was placed in the thermocycler and incubated at 37 °C for 4 hours and then held at 4 °C. Table 2 Non-Modified Transcription contents and concentrations. Table 3 Fluoro-Modified Transcription contents and concentrations. Following transcription, a small volume of the sample (~5 µl) was used for viewing in a 6% acrylamide denaturing gel. The sample was run beside a 1 kb ladder at 20W for 1 hour. The gel was then viewed under UV light to check for correct sequencing. If the sequence length was correct and a nice band was present, the sample was then purified using the Monarch RNA Clean-Up kit. 31 µl of elution buffer was used for purification and 1 µl l of sample was used for analysis with the Nanodrop 3000c. The optical density (A260) was recorded and Beer’s Law was used to calculate the molar concentration of the sample. The sample was then heat annealed by heating at 95°C for 5 minutes followed by cooling at -20 °C for 3 minutes. A 5X DNA tile buffer was then added and the sample was heated to 37°C for 30 minutes. A 1X DNA tile buffer was used to dilute the sample to the desired volume for further use. Keefe, A. D., and Cload, S. T., SELEX with modified nucleotides, Curr. Opin. Chem. Biol. 2008, 12, 448–456. Beaudry, A., DeFoe, J., Zinnen, S., Burgin ,A., and Beigelman, L. In vitro selection of a novel nuclease-resistant RNA phosphodiesterase. Chem. Biol. 2000, 7, 323–334.